A place to restore the self amidst a busy (work or shopping) schedule, Plentyfull offers quick nutritional bowls during midday and loving wholesome plates as the sun sets. With food here made from scratch and cooked from the heart, owner Claudia Sondakh wants to provide patrons with a home-cooked meal away from home. Besides the all-day dining, there is also a small gourmet grocer which you can check out. What’s a Plentyfull dinner? Plenty-full of food, and goodness of course! Taking the before meal bread basket to a different level, Plentyfull serves House Flatbread ($10) with funky nori butter and elderflower caramel EVO oil. And it works! 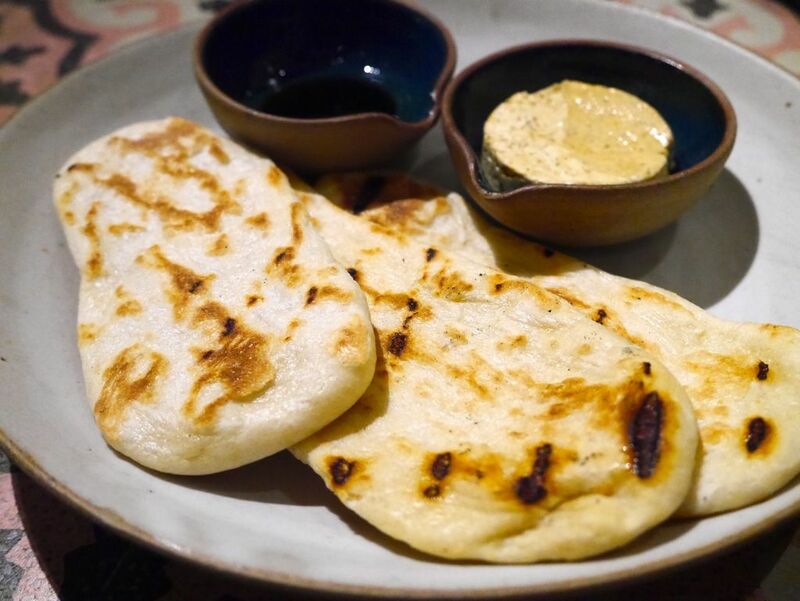 Unami soft smooth butter and sweet floral notes compliments the slightly charred flat bread. 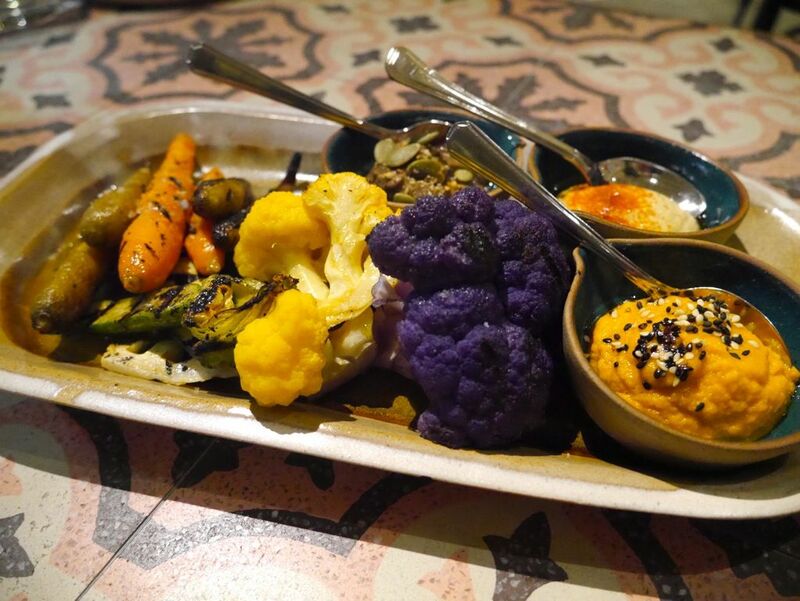 You’ll love your vegetables (more) with Little Farm’s Vegetable Dip ($16) with seasonal vegetables. This rainbow platter is definitely a good visual of what nutritionists have been advocating for your daily nutrition. 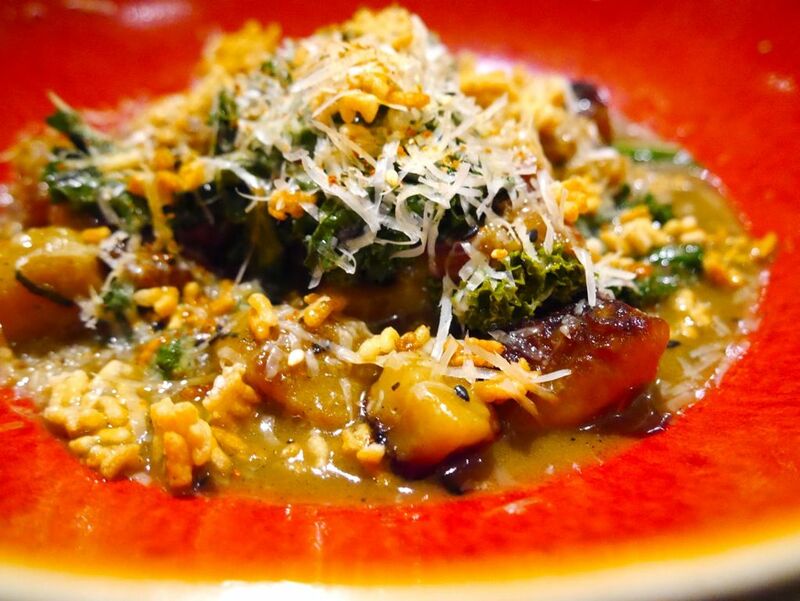 Did you know that purple cauliflower has the antioxidant anthocyanin that can also be found in red wine? (Well, i can’t resist anything remotely linked to wine!) The lightly salted charred vegetables are good on their own, though there are also three dips that can coax a vegetable hater to love the dish. My favorite is the Mediterranean spiced dip with pumpkin seeds. 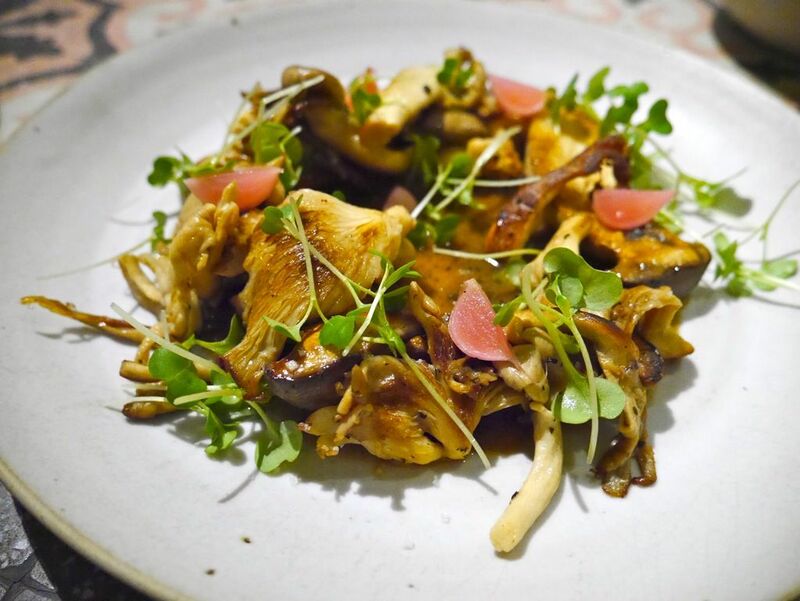 Big and plump Grilled Kin Yan Farm Mushroom ($18) with smoked onion puree and pickled radish is a delight if you want to savor meaty flavors but are on a vegetarian diet. 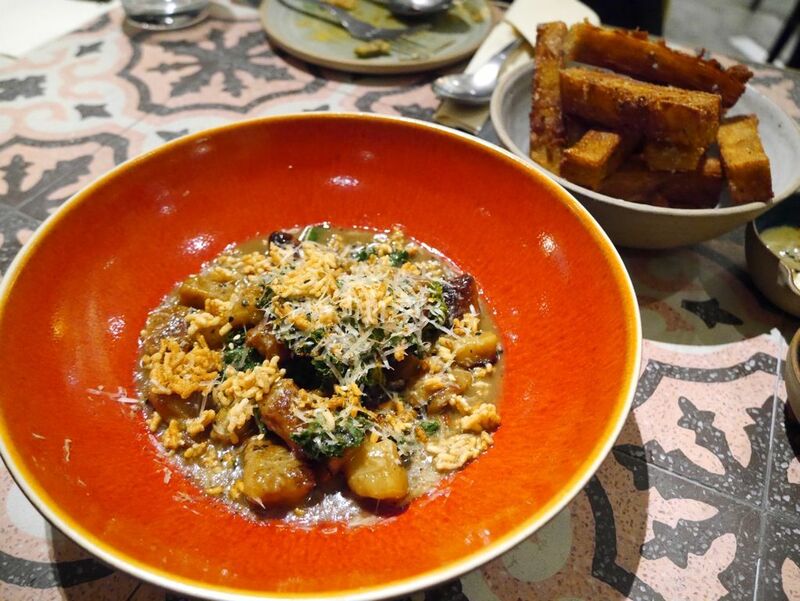 A vegetarian main, Pumpkin Pillow Gnocchi ($24) was sorely lacking in flavors despite being cooked in the usual brown butter and sage, and topped with wilted leaves and pecorino. For the record, Plentyfull is not a vegetarian hangout. 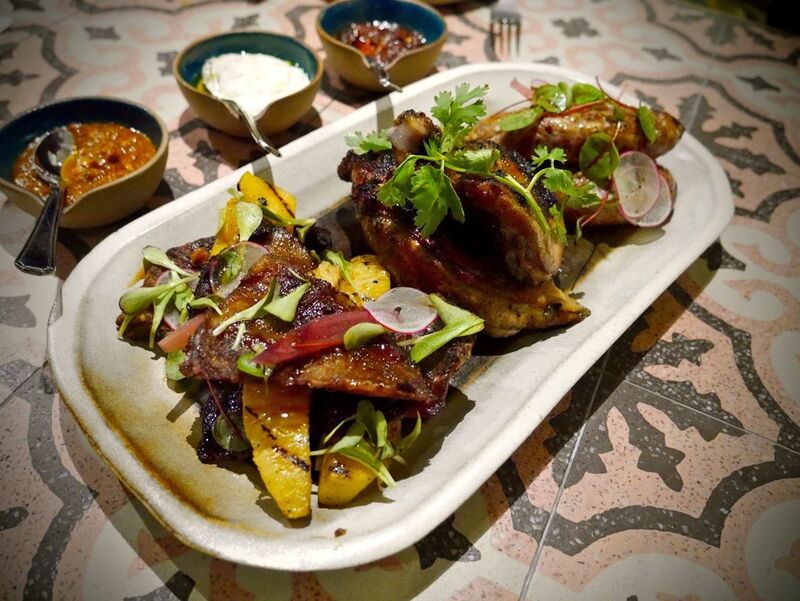 Tuck into the Smorgasbord of Plentyfull: Chicken | Pork Jowl | Lamb Merguez ($48) served with sambal belachan, Thai chilli jam and cucumber mint yoghurt. 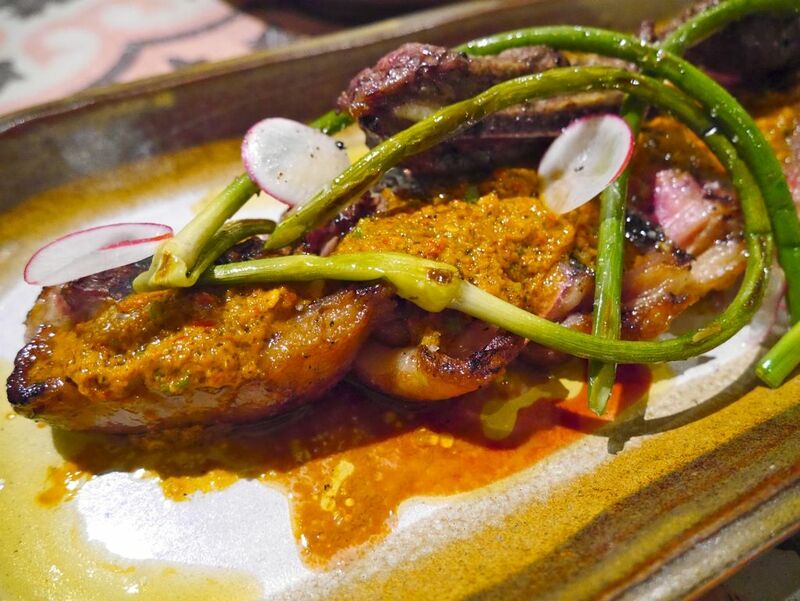 Individual dishes of these proteins can be found on the menu—Thai Roasted Chicken with Garlic & Cilantro ($26), Glazed Mangalica Pork Jowl ($26) and Smoked Lamb Merguez Sausage ($24). The latter stood out for its Middle-Eastern spiced flavors that has strong hints of onion. The roasted chicken is a special recipe of the owner’s that brings a sense of comfort with each bite. Another flavorful meaty option is the Pure Black Natural Angus Strip Steak ($36). Dry aged natural grass-fed steak is served with Asian salsa and garlic sprout. Do tell them how you would like it done, ours was a tad too raw. Fancy a simple dish of Pan-fried Farmed Barramundi ($26)? 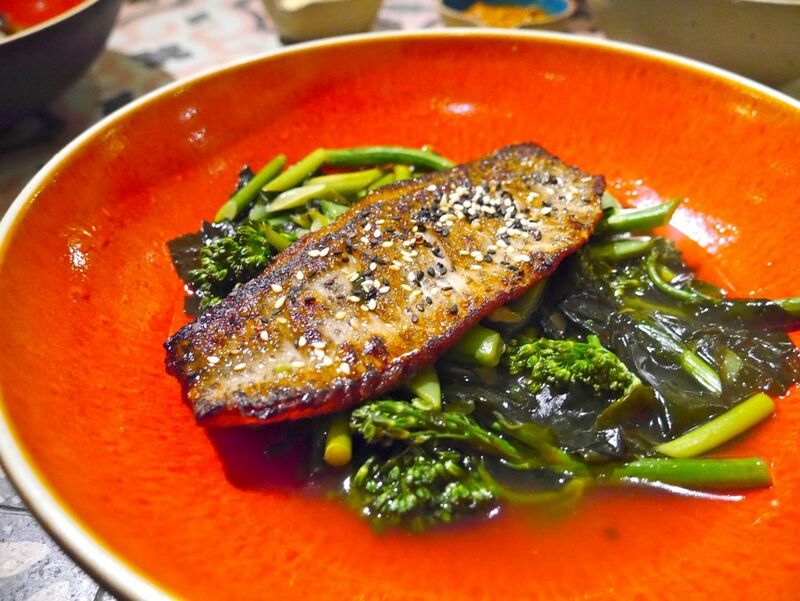 Served on a bed of quick-braised local and seasonal greens (there were broccolini and wakame on my plate) in a light tasting yuzu wasabi glaze, the fillet was fresh and tender with a crispy skin. Munchies for your drinks include Plentyfull Fries ($12) and Tempeh & Tofu Fries ($10). Russet potatoes shaved, stacked, steamed and fried, these huge sticks are comforting with the crispy edges. 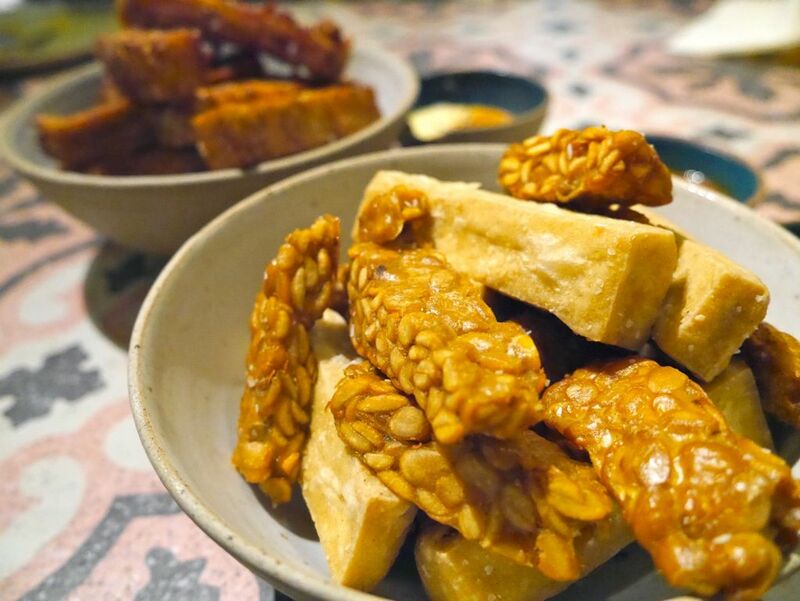 House-made fermented soybean and pressed tofu fritters reminiscent of childhood pack freshness. Dipped in sambal belachan or/and kechap manis, I can finish the serving on my own. Easily. Finding a place for cakes and pastries? The cakes and tarts on display looked appetizing. The tarts vary due to seasonal produce, so grab them immediately if you find yourself drooling. The cakes at Plentyfull are quite tasty. Queen’s Cake ($9) is a strawberry sponge layered with rose cream and fruits, while Mango Coconut Cake ($9) is a vanilla sponge layered with coconut cream and mangoes. I am swayed towards the latter despite my love-hate relationship with coconut. The winning factor is the tropical combination of fresh mangoes and intense coconut. 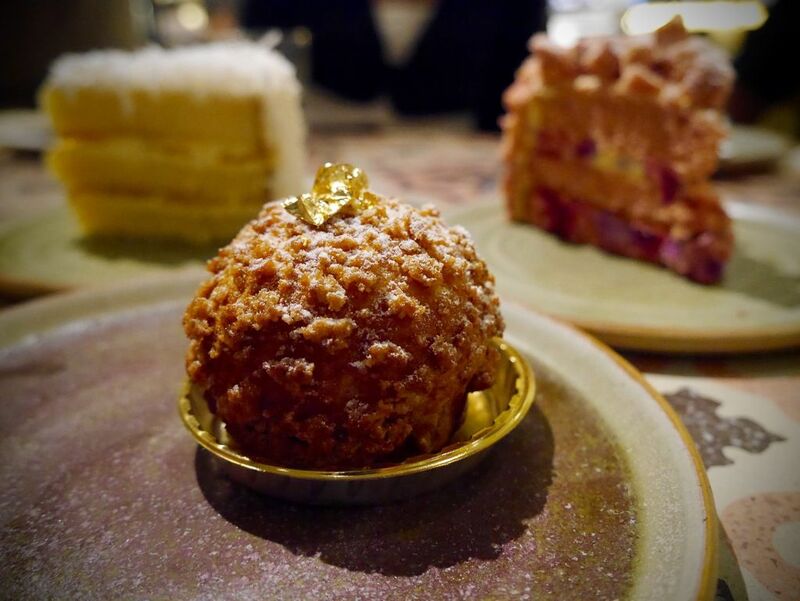 If you prefer something lighter, the custard-y Choux Puff ($6) might just satisfy you. Plentyfull has plenty of choices albeit some hits and misses. Nevertheless, it can be an option for family and friends to gather for a home-cooked meal without the fuss of a messy kitchen and dirty dishes.